Life has been busy, for sure. Not a good excuse for skimping on blog updates, but we're using it anyway. Should have some time this weekend before finals hit, so I can finish putting some videos together of recent fun-times we've had and tweak some more photos. 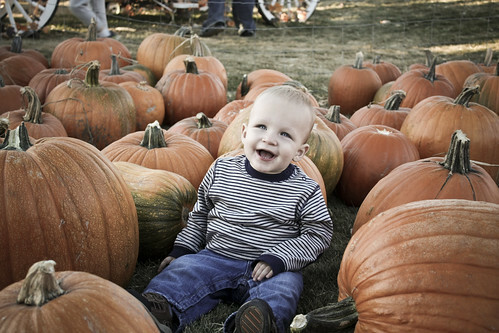 In the meantime, here's a fun photo of Carter enjoying pumpkins last month... well, October. Man, that was two months ago. Does anybody else feel like fall came and went while you weren't looking? Great picture, and that's about how October and November went for me too. FINALLY! atleast when I log on your your blog 50 times a day to see if you've updated I have a fun picture to look at. Such a cute picture. I bet you're excited for finals. Then a nice LONG break huh?? We're getting excited to see you guys this month. Silly that we are going 900 miles to get together huh. Talk to you soon. Good luck with the end of your classes. Cindy! How are you? I haven't talked to or seen you in forever! 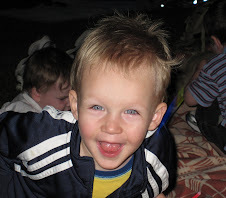 your little boy is so cute :) Hope everything is going great!